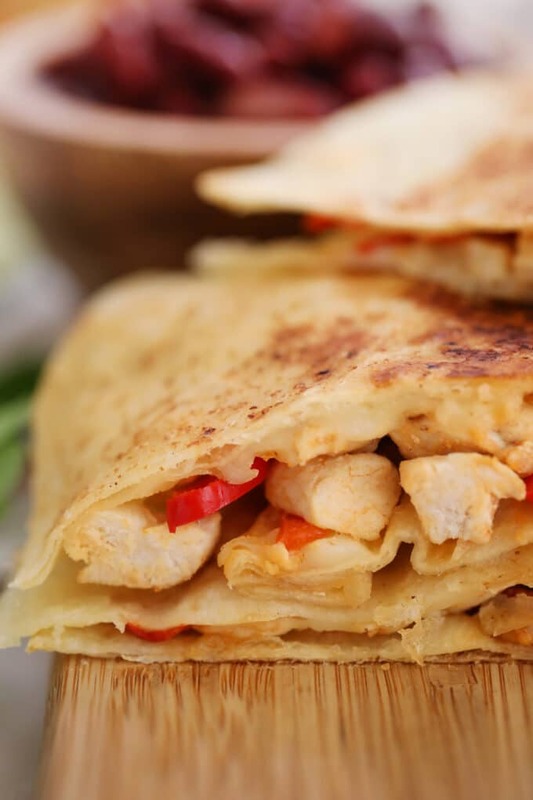 Chicken Quesadillas are the perfect mix of fast, easy, and crispy. With only a few minutes of total cook and prep time, this hearty meal will save you time and effort. I love making these at home. 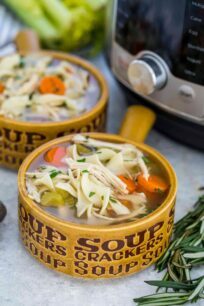 I also really enjoy making other dishes that involve tortillas such as Slow Cooker Chicken Tortilla soup and Tortilla Pizza because of how versatile they can be! Chicken Quesadillas are better than cheese quesadillas because they actually have more protein inside of them. The best kind of tortillas to use are flour tortillas because I think that they mix better with chicken and cheese. I prefer to use a rotisserie chicken so that I can shred it. However, using an uncooked chicken breast and then cooking and shredding it is a good way to go as well. I love putting in cilantro and green onions inside the quesadillas because it adds a little boost of flavor and color. This is also the perfect party food, because of how easy it is to make, plus who does not like chicken and cheese quesadillas? Be careful with them though, they tend to burn easily. Keep your eye on the tortillas to make sure that they cook thoroughly and do not get burnt. I have definitely found myself accidentally burning them. So be sure to keep them on the stove for a few minutes on each side. Once they are golden brown you are good to go and ready to serve! 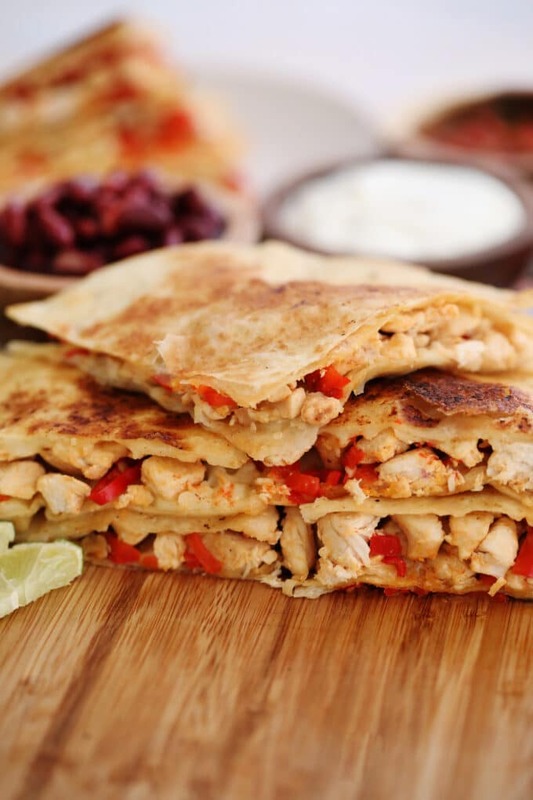 How to make/season chicken quesadillas? Start by taking the chicken and shredding it, place it inside the flour tortilla along with some cheese. Season this dish by adding some paprika on top. Add some lime juice for the fresh taste and voila you have a beautifully seasoned dish. How to make chicken quesadillas on the stove/ oven? 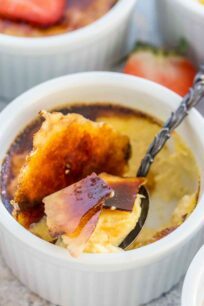 Making this recipe on the stove is super easy! All you have to do is put all the ingredients inside of a tortilla and set the pan to medium heat. Be sure to coat the outside of the tortilla with unsalted butter to get that desired even golden brown crispiness to it. Place the tortillas in the baking tray. Add the rest of the ingredients and top with another tortilla. Cook them for approximately ten minutes or until they are golden brown and enjoy! 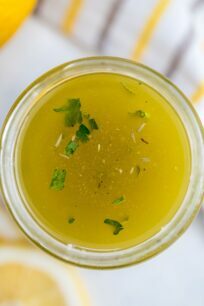 How to make chicken quesadillas sauce? By combining paprika, cayenne pepper, garlic powder, sugar, cumin, minced jalapenos, mayonnaise, jalapeno juice, and salt. Mix the ingredients together in a small bowl and place them in a small serving bowl for dipping. How to make chicken quesadillas like taco bell? Stir together jalapenos, sugar, cumin, paprika, cayenne pepper salt, jalapeno juice, and garlic powder until it is mixed well and smooth. Use American cheese and place it inside the tortilla with the chicken. Place the tortilla with the ingredients inside over medium heat. Cook the tortilla until all the cheese is melted. I really like serving these with salsa, beans, guacamole, and sour cream. This makes the meal complete and tastes really good. Also, I love to have a side of Pico de Gallo and Guacamole. 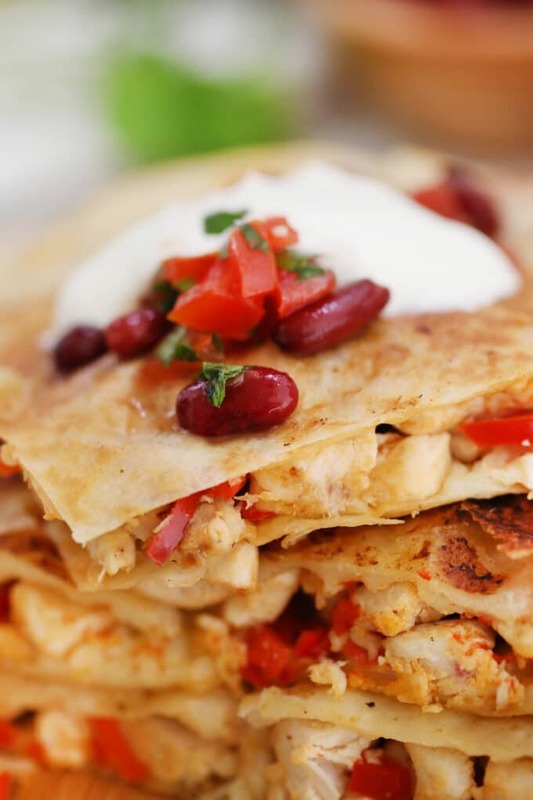 How to make chicken quesadillas with canned chicken? Drain the excess liquid that comes inside of the can then take it out of the can. Place it inside of the tortilla with cheese. Cook the tortilla with all of the ingredients inside. Add 2 tablespoons olive oil to a large cast iron or non-stick skillet over high heat. Add in the sliced bell pepper and cook until tender and dark brown/black areas appear, about 3 to 4 minutes. Remove and set aside. Sizzle 1/2 tablespoon of the butter in a cast iron or non-stick skillet over medium heat and lay a flour tortilla in the skillet. Build the quesadillas by laying grated cheese onto the tortilla, and then arranging the chicken, cooked pepper and jalapeno rounds. Top with a little more grated cheese and top with a second tortilla. When the tortilla is golden on the bottom side, carefully flip the quesadilla to the other side, adding another 1/2 tablespoon butter to the skillet at the same time. Continue cooking until the second side is golden. Repeat with the remaining tortillas and fillings. 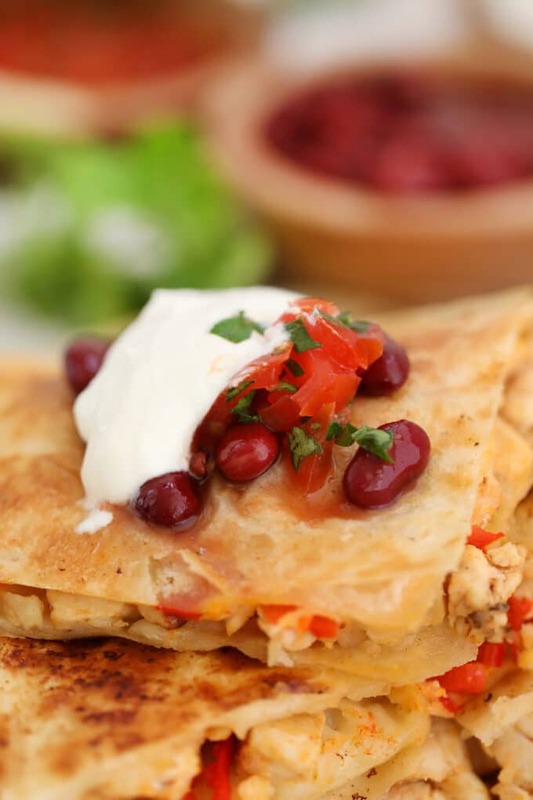 Cut each quesadilla into wedges and serve with Pico de Gallo, sour cream and black beans on the side. Quesadillas sound really good right now and these look delicious. My family will like them a lot! I have to say, your chicken quesadillas are way more extravagant than what I make! Adding onions, cilantro and rotisserie chicken (I used canned, heated with some taco seasoning) sounds a whole lot better! Oh my yum! These looks so yummy! I cannot wait to try these this weekend! We make them on the stove all the time. Our trick is to put some cheese on the outside! My kids LOVE quesadillas! And they are such a delicious and easy meal! Oh, how I love quesadillas! I will definitely try this recipe soon. It looks so delicious!